Please schedule your proctored exam a minimum of 24 hours in advance. Once you have selected Instructor, Course Name and Exam Name options, a calendar and time selection box will show. --Click on the date you want to take your exam. 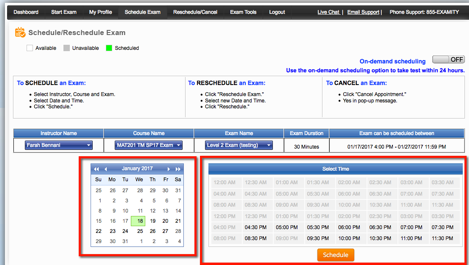 --Click on the time you wish to schedule your exam from the available time slots. You will see an overlay screen asking you to confirm that you want to schedule this appointment, Click Yes. You will be returned to a screen that confirms the exam information. Also, you will receive a confirmation email that will be sent to your student.cccs.edu email address. Posted by: Kristin Rivedal - Thu, Jan 19, 2017 at 3:43 PM. This article has been viewed 2815 times.